I don’t know about you, but when I am near a Chinese restaurant and get a whiff of those delicious smells filling the air, my mouth starts to water and I start craving vegetarian eggrolls! Vegetarian eggrolls have always been my favorite part of a Chinese or Thai meal, but it is sometimes difficult to find ones that are vegetarian or that don’t have questionable ingredients like MSG in them. In addition, it seems like you get very little quantity for the price you pay. So, many years ago I came up with my own recipe for these Very Veggie Vegetarian Eggrolls! Making these amazing Very Veggie Vegetarian Eggrolls at home allows you to make a large quantity at a very affordable price. With such a savings, and with lots of fresh ingredients, veggie eggrolls can become less of an appetizer and more of a meal that the whole family (and guests too!) can enjoy! In fact, it is so easy to make a large batch of these, and they are so delicious, that they have become a requested favorite at many of our family gatherings. My parents were recently visiting and they were delighted to find out that I would be making my amazing Very Veggie Vegetarian Eggrolls! They are also great for meal prepping because they can be frozen and reheated in the oven later. This makes for a very quick and satisfying meal on one of those hectic nights when you just don’t feel like cooking, or for a healthy lunch or midday snack. Although this is an easy recipe, it does take a bit of time to wrap and fry the rolls, so plan accordingly. It will probably take about 40-50 minutes to make a batch of about 15 rolls. Eggroll wrappers are not always vegan friendly. They often contain eggs, thus the name “eggrolls”. If you are vegan, make sure you check the ingredients and look for ones that don’t contain egg. I was able to find a vegan-friendly brand at my local King Soopers grocery store. You can also replace the traditional “wonton” style wrappers with brown rice-paper wrappers, or make your own from scratch. I just found a vegan, gluten-free and peanut-free eggroll wrapper mix on Amazon. I have not tried making it myself, but I will try this in the future and share the recipe with you. This, of course, would add some work to what is otherwise an easy recipe. Our favorite way to enjoy these Very Veggie Vegetarian Eggrolls is with some sweet-chili sauce and a sprinkle of tamari. I know you and your family will enjoy them too! 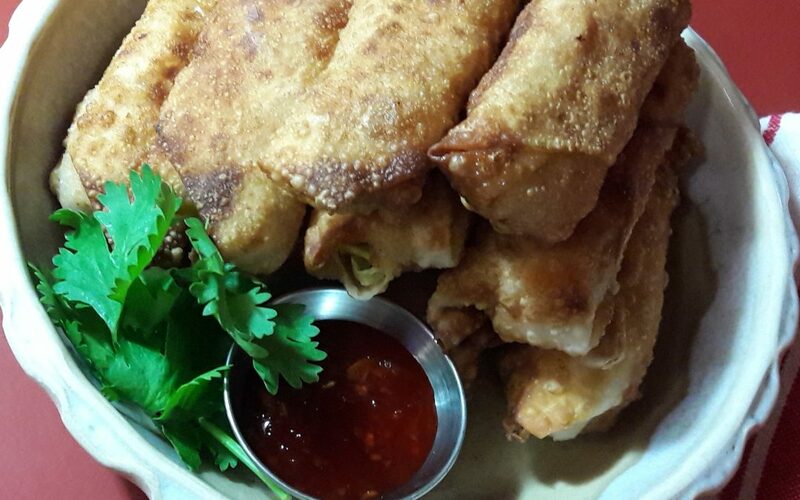 These amazing Very Veggie Vegetarian Eggrolls will have your mouth watering and your guests asking for more! An easy recipe for making eggrolls at home that the whole family will love! Put the oil in a heavy skillet and place on medium heat. The oil will need to be nice and hot in order to fry the eggrolls correctly, but don't let it overheat! If it starts to smoke, turn it down a bit. Next, press the tofu with some paper towels or a clean kitchen towel in order to get the excess water out. Place the drained tofu into a large mixing bowl. Mash the tofu with a potato masher or fork. Add the shredded cabbage, carrot, onion, ginger, and black pepper to the mashed tofu and combine thoroughly. Open the package of eggroll wrappers, leaving them in a stack on a flat surface. You will need a small dish of water next to your wrappers. Have a large plate ready for placing the rolls on and another lined with paper towels next to your skillet. Place a small handful (about 1/3 cup) of the mixture in the middle of the wrapper. Take the closest corner to you and fold it away from you, covering the mixture. Fold each of the ends toward the middle, put a small amount of water with your finger on the far edge of the wrapper, and then roll it away from you until it is sealed by the moist edge. *Illustrated instructions can usually be found on the inside of the package. When all the rolls are wrapped up, it's time to fry them! Your oil should be good and hot by now, but you can test it by placing a wrapper scrap or vegetable scrap in the oil. If it sizzles readily, it's ready! I usually place three at a time in my standard-size skillet. This keeps them from getting over-crowded and cooling the oil too much. They will cook quickly, so keep an eye on them! Turn them over to cook on the other side when the bottom side is golden brown. I usually use metal tongs for this task. When they are totally golden on both sides, carefully remove them from the oil . If you tip them sideways as you pull them out, any excess oil that may have gotten inside will drain out. Place the rolls on the paper towel-lined plate. It is best to cook them all before serving, but you will probably find that some people just can't wait! Serve with sweet-and-sour or sweet-chili sauce and some tamari or soy sauce. To freeze: I usually make two batches of these and freeze some. I get a large rectangular storage container (such as Glad, Ziplock, or Tupperware), line the bottom with a paper towel and then place the eggrolls side-by-side across the bottom. Then I put another paper towel on top and repeat until the container is full. Put the lid on and place in freezer. I usually reheat them on a pan in the toaster oven in order to restore their crispiness. You might choose to microwave them, but they will have a very soft texture.